Will the family tree be intact when I move to another town? @TroyTalks For what you're trying to do, you'll need NRaas Traveler; adding ErrorTrap and Overwatch is a really good idea too, since the travel transition can break even with Traveler in place. With Traveler, you can have all of the interconnected worlds you want, and you or your sims can travel back and forth among them as often as you'd like. Porter, on the other hand, simply allows you to pack up large groups of sims and save them as you'd save a household to the bin. You can then drop the sims into a brand-new save, and the sims you packed together will have their relationships with each other intact. It's just a better version of the EA-standard bin transfer in that it allows you to bring larger numbers of sims into a world while keeping their relationships with each other. But you'd still lose all the data from the previous town and the sims you left behind there. So-I have tried using the Traveler mod (which works very well) but I hit a snag when I tried to send members of different families (from my hometown) to the same traveler world. -I am using Moonlight Falls as my main world (hometown). -I play 2 families in Moonlight Falls (the Van Goulds & the Wolffs), frequently alternating between the two. Using the Traveler mod, I successfully moved the Van Gould children to Twinbrooke with their family tree in tact. So now, I am trying to move the Wolff children to the same version of Twinbrooke, alongside the Van Gould children, but what happened is that during the attempt, the Wolff children were sent to a brand new Twinbrooke, separated from the Van Gould children. So is there any way I can send sims from different families to the same Traveler town? or would I have to use the Porter mod to do this? TOPIC: Is there a way to use one of the towns from another save-game as a vacation world? Note that you should always backup your save-games prior to moving the physical files around. Locate the save-folder for the save-game you are currently playing (use the file explorer's "Date modified" filter if you're not sure what your latest save is). The next time you travel to that particular town, it will now use the town-file you copied into the save-folder. You should probably ensure that there is a base-camp, or at least one empty residential lot available, or you may encounter difficulties traveling to the destination." ...but this didn't work for me. Any ideas? How exactly did you try to do this? You should have been able to travel back and forth between the two worlds if they were in the same ongoing game and not be presented with a brand new copy of either one if the mod's Change Hometown had been fully invoked on the first household. You also could have stayed in the second world and used MasterController to pull the next household in and place them in a residence without leaving. They lose their wealth and possessions this way, so some players do the back and forth thing instead to move them in but sometimes the quick way works out better in the long-run. As for the Sims losing their wealth, that doesn't bother me because I can use cheats to restore it. But I would be afraid that they would lose their relationships, disrupting their family trees if I did it the quick way. Let's review the procedure as outlined on the FAQ page. It is crucial to follow each step exactly, none of these are optional. 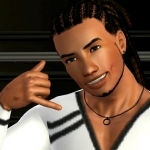 -Vacation your sims from World A in World B. Have them stay anywhere temporarily, even an empty 10x10 residential lot is fine if there is no Base Camp. - Have them purchase a vacation home. You may need to change the one you wanted them to move into to Residential-(Player) Ownable to make this happen, and you may need to change it to Community (No Visitors Allowed is fine) in between to get the change to Ownable to stick. - Have them move into the intended home from where they were originally staying. - Invoke Traveler's Change Hometown on them. - You MUST save (as), quit all the way to the Desktop (or Origin), and reload as you are prompted to do at this point otherwise the game remains in a fragile state. That's it, the household is now permanently residents of World B and travel back to World A (the correct one) can be done or sims can be pulled into World B as the FAQ says. If you skip any of these steps or do not do a Change Hometown, then you are really still in vacation mode even if it doesn't "feel" like it and either travel back to World A will indeed spawn a new version of that world or other unexpected things can happen like you can't get back into World B if you travel away from it again. When done properly as above, using MC to pull in sims from World A should not break their relationships nor their family trees but even if it does that can be fixed up with MC commands. What tends to do that is inviting them over as guests and then marrying them or forcing the otherwise mini-sim versions of them to become residents. The MC Add Sim > Homeworld command pulls in full-fledged sims, not mini-sims. You may still see the original copy of these sims back in their homeworld on the greyed out portion of the relationship panel, but those will get resolved eventually and can just be ignored if Overwatch and ErrorTrap are in play. There is also EA's Move to New World function that essentially destroys the original world going forward. Traveler is supposed to protect the original world when that function is used instead of the vacation fake-out method above, but it just isn't very reliable and things still tend to go wrong. I never use it. The nhd file hocus pocus is not part of this procedure. It is for when you have two totally different saved games and you want to connect a world and its sims that are in one game save with a different world and its (different) sims that are in a different game save. If the same sims are represented in both game saves, you will get some unreliable and strange results. It is also useful for when you have edited World B, where sims might move to, and wish to use that one as the new target so you don't have to keep redoing the world edits over again, it's not for replacing where sims have come from. Forgive me for the late response, I just wanted to try this out several times with several towns and several families to make sure that the family trees would all remain in tact. Everything worked perfectly and I can't thank you enough for the help! I did notice one minor thing that might alarm people who try this. Sometimes when changing hometowns, the portraits of my sims' relatives disappeared from the Relationship panel and the active sim wasn't able to call their relatives in different towns - which made me fear that my sims families had been wiped from existence -but not to worry ! Whenever this happened, I found that the family trees still remained in tact and that when going back to the town i was playing in before , the sims i had left behind all retained their relationships. So none of the family trees were ever disrupted, no matter how many times i traveled. This is such a cool feature and it really has added another layer of depth to a game that , for me, never gets old. I am currently enjoying an "All-in-One" aspect of gameplay which wouldn't be possible without the Nraas Traveler and Porter mods. And it's all surprisingly smooth and not as glitchy as I thought it would be. Thanks again igazor! @TroyTalks - Glad to hear it. This is indeed one of the mods that made the game come more alive for me so many years ago. On the relationship panel thing, I have heard players speak of this but they usually manage to put up with it as long as they know everything else about the connected worlds is working as it should. I've never experienced it, except with a few custom made worlds I had tested out that were not ID'ed uniquely during their design stages and just won't work with Traveler (so the foreign sims missing on the panel in that case is the least of one's worries as nothing works right). The NRaas RelationshipPanel mod might help if you don't already have it in play.